OK, I think I need to finally admit something publicly - I never saw Trainspotting at the cinema. In fact, I only watched it recently because I was going to go watch T2. And yes, I probably should have watched it sooner, but I've been busy. And yes, I probably should have gone to see it at the time - but, unfortunately, when everyone tells me I HAVE to do something, I have a compulsion to go and do anything but just because. There was also the small matter of me being a high-horse riding little git back in 1996. I hated all drugs (yeah, even though I drank regularly) and had no interest in dance music. In short, everything people said Trainspotting was about were all the things I wasn't going to voluntarily subject myself to. Ahh, the arrogance of youth eh? 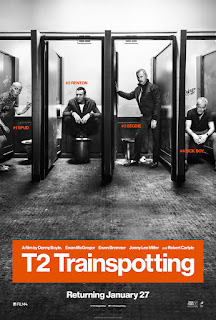 So, 20 years on I sit down and thoroughly enjoy Trainspotting. Sure, I can't understand the world Renton, Spud and Sick Boy inhabit - mine was a very different childhood and teenage years - but the film, as the whole world had been telling me, was bloody good. And only director Danny Boyle's second film. Which when you consider some of the visual tricks he pulled off, is brilliantly staggering. Yes, it's a sequel people have waited 20 years for. It could be argued that, after all this time, it's a sequel no one really needed. The original being so right for it's time n all. Overall, the word had been good - and being older (sadly a fact) and wiser (up for debate I grant you), I'm now more open minded and happy to make an informed judgement rather than shove my head up my arse as 23-year-old me was content to do. Which is just as well. Because OH MY GOD. 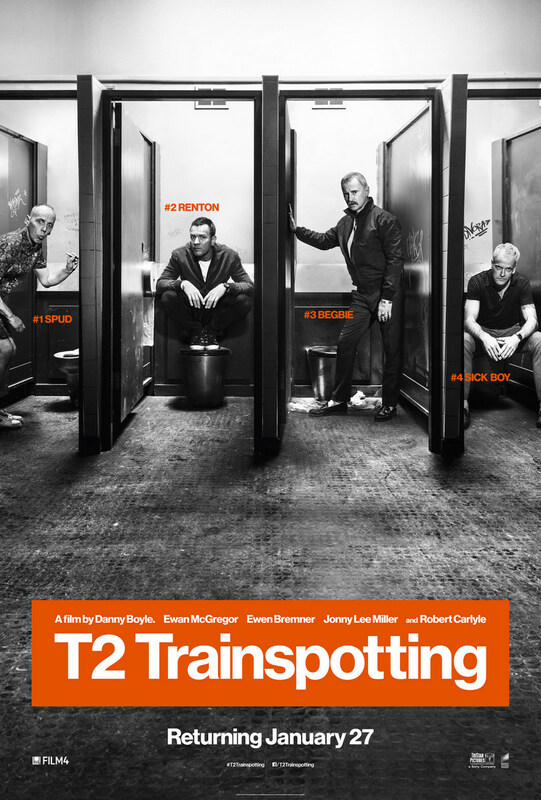 Reuniting Ewan McGregor, Ewan Bremner, Jonny Lee Miller and Robert Carlyle, T2 brings us back into the world of Renton, Spud, Sick Boy and Begbie 20 years after we left them. And, on the plot, that's all I'm going to say. Renton's been away, and he's back. There's music to face, friendships to renew and family to reconnect with. To expand beyond that could, and almost certainly would, lead to spoilers. Because what unfolds isn't just a tale of four people whose lives have intersected once more, but an essay on growing up. And this is the real power of T2. While others have strong emotional connections with the original film, I do not - and yet throughout T2 I was on the edge of my seat, I was moist of eye at times, on one occasion I was actually holding my breath. And with one particular scene, I was actually angry. Not at its inclusion, but that the characters were allowing themselves to behave in such a way. Because, such is the power of T2, within minutes I was wrapped in their world. I genuinely care about these guys - far, far more than I did about them 20 years back. Such is the quality of John Hodge's screenplay, and Boyle's sublime directing, that they have created a whole new world - one about regret, nostalgia, reminiscences, a world anyone who is 20 years older than they were in 1996 can empathise with. It helps if you've seen the original, sure, and there are nostalgic nods throughout - but such things also serve to provide backstory if you are hitting this for the first time. And it's a perfect tool to help underpin the films central theme of ageing - of looking back over your life, especially after some fairly major events. But this isn't a nostalgia piece - as Trainspotting had something to say about the party generation and those left abandoned in inner-city Scotland, so T2 has things to say about life today, about gentrification, about where we go in life. But don't read that to mean this is a sombre, maudlin piece. From the off this film has buckets of energy and a great rhythm - and with the breathtaking drama come moments of unbridled joy and hilarity (Renton and Sick Boy's singsong in the club being just one highlight). This film is nothing short of magnificent. It is simply stunning. An emotional rollercoaster in every sense of the word. As a measure of just how powerful this film is, as we left the cinema I wouldn't say anything. I couldn't. Because I knew that if I opened my mouth I would just burst into tears. It took me nigh on two minutes to compose myself. It took me even longer to work out why this film had an even bigger impact on me than I, Daniel Blake. And it's simply this: I'm older now. I've done stupid stuff in my life, been through things, and looked back over the passing years. And that's what T2 taps into - in a beautifully, brilliantly, brutal way. 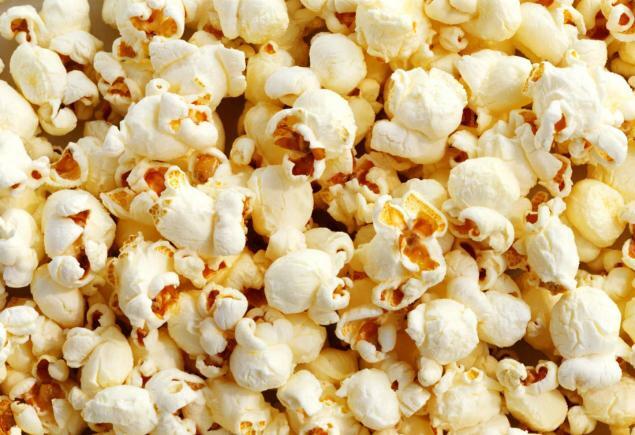 It makes you laugh, it makes you angry, it plays with every emotion you have many, many times over. It makes you feel things long forgotten, and it makes you love the guys on screen. For many, Trainspotting was THEIR film, the soundtrack was their life. Fek that. I'll watch it on me death bed. Last thing I need at the moment is more melancholy.